This baked pork chop recipe is breaded for extra flavor, but it’s still totally low carb and keto friendly! It’s a family favorite in our house and I bet it will be in yours too! 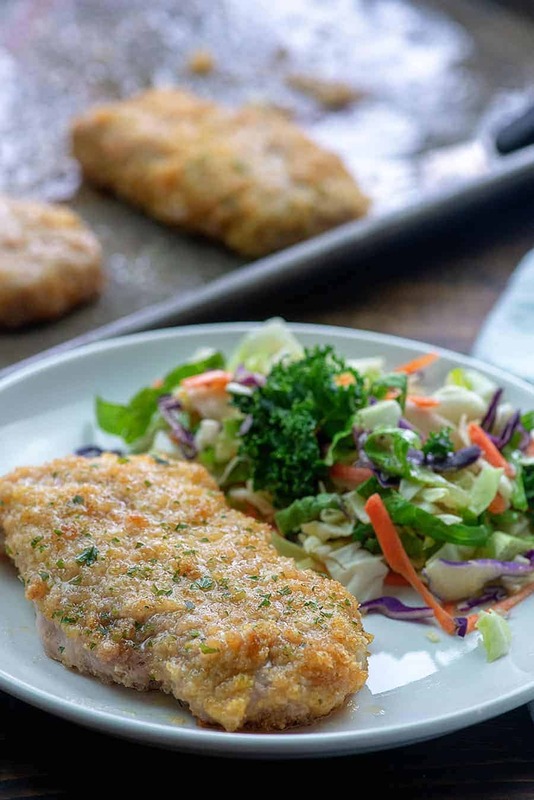 Scroll to the bottom for the complete recipe, but be sure to read through the post for all of my tips and tricks for these breaded baked pork chops! We love pork for breakfast in our house and it’s just as big of a hit at dinner time! Anyway, these baked pork chops are a super simple, family-friendly recipe that is totally low carb and keto friendly. 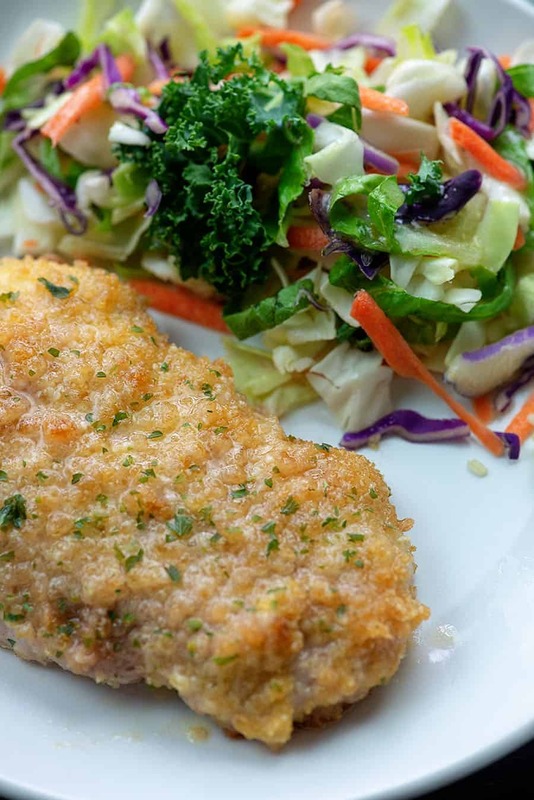 We love breaded baked pork chops because it doesn’t feel like a low carb dinner and the breading adds a nice flavor and a bit of crunch to the outside of the pork chops. Please note: these pork chops will NOT get quite as crispy as they do with bread crumbs, but we all LOVE these breaded pork chops anyway! They’re perfect, if you ask me! 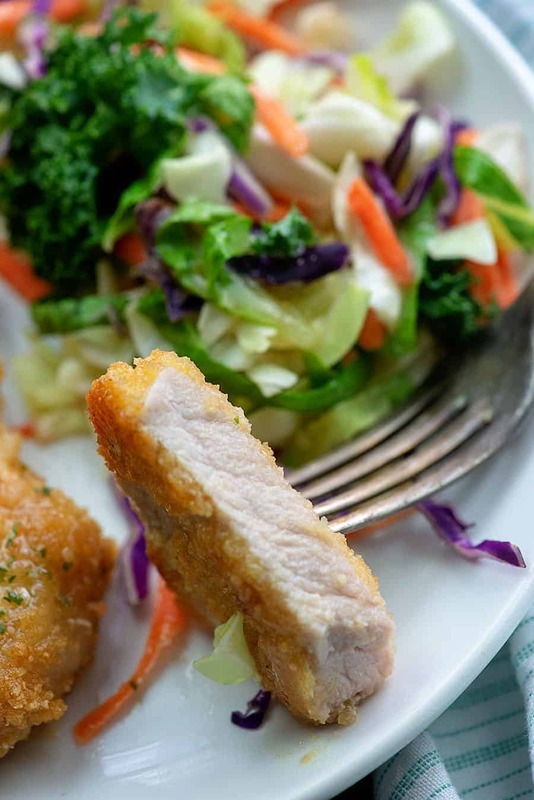 We’re keeping things low carb and super simple with these low carb pork chops! First, you’ll want to grab a bag of pork rinds and crush them. You can use a meat tenderizer to crush them in the bag or you can pop them in your food processor. Both work well. Combine the crush pork rinds with some powdered Parmesan cheese, garlic powder, and onion powder. You’ll also need a couple of beaten eggs to dunk your chops in. 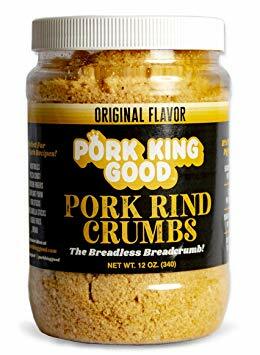 This will help the pork rind breading stick to the pork chops as they bake. Preheat your oven to 400 degrees and spray a baking sheet with non-stick spray. 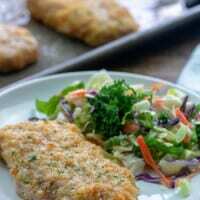 Place your breaded pork chops on the baking sheet and pop them into the hot oven. This will depend on the thickness of your pork chops. For boneless chops that are about 3/4 – 1-inch thick, you’ll want to bake for 15-20 minutes. I don’t recommend baking thinner pork chops as they tend to dry out quickly. Pork can be served a bit pink in the center or you can cook it entirely through. 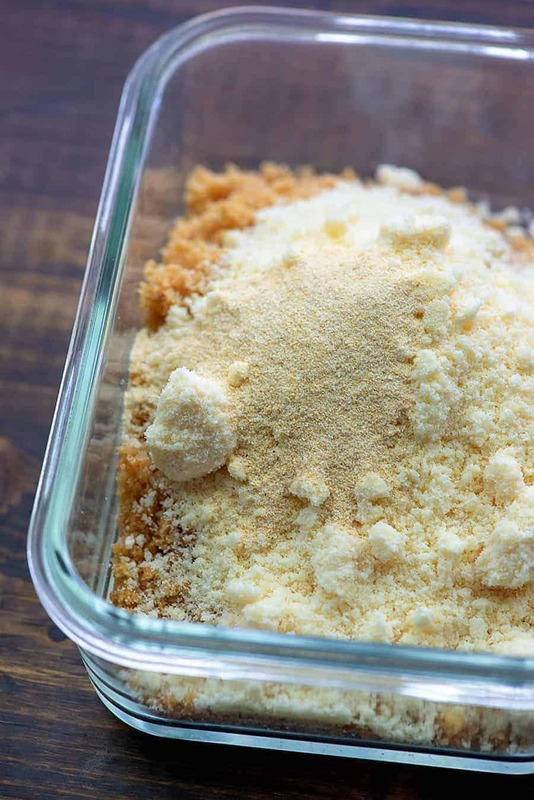 Food Processor: This is not necessary for turning the pork rinds into crumbs as you can do this by hand, but it makes it so much quicker and easier. 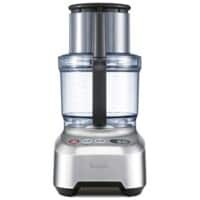 We use this food processor for everything from slicing veggies to shredding cheese. 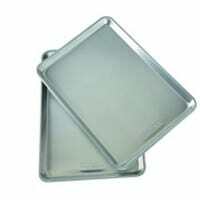 Baking Sheet: A large rimmed baking sheet is a kitchen essential. My mashed cauliflower and keto coleslaw are perfect alongside pork chops. Broccoli with cheese sauce is a favorite. A side salad with ranch dressing is always a simple option, too. These low carb breaded pork chops get a little crunchy on the outside and are nice and juicy inside! Preheat oven to 400 degrees. Spray a baking sheet with non-stick spray. Crack the eggs into a shallow dish and beat well. Add the pork rinds, Parmesan, parsley, garlic powder, and onion powder to a second shallow dish and stir well to combine. 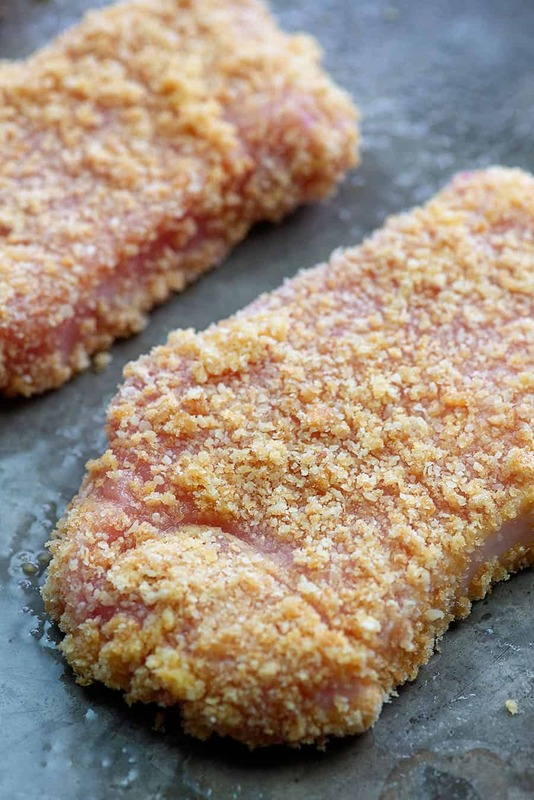 Dip the pork chops, one by one, first into the egg and then into the pork rind breading. Press the breading firmly into the pork to be sure it sticks. Place the pork chops on the baking sheet and bake for 15-20 minutes or until pork reaches a minimum temperature of 150 degrees and up to 160 degrees. Baking time will vary depending on the thickness of your pork chops. Look for pork chops that are close to 1 inch thick. Please note that the protein in the nutrition information includes the protein from the pork rinds, which are considered an incomplete source of protein. I made these and they were fantastic! Juicy and delicious! Will definitely be making them again…..and I also used the breading recipe to make chicken fingers! Yummy! Can i do these in a convection oven? Yes, but you’ll need to convert the temperature or bake time.